There may be a lack of green spaces in the core, but with the right know-how, backyard-deprived condo dwellers can nurture plenty of beautiful blooms and tasty veggies right on their balcony. Container gardening is a great option for those wanting to take advantage of, and transform, their smaller outdoor spaces. “It connects us back to the natural environment that we often disconnect from as urban dwellers,” says Justin Keats, Garden Director of Oliver Community League. Throughout the spring and summer, Keats teaches Oliver residents gardening basics and how to get the most out of their tiny outdoor spaces. Check with your condo board or property manager for any guidelines or restrictions. This may affect the amount of space you can dedicate to your garden, height and weight of plants and pots, and even overall placements. Start with a plan, and start small. Decide how you want to use your space. 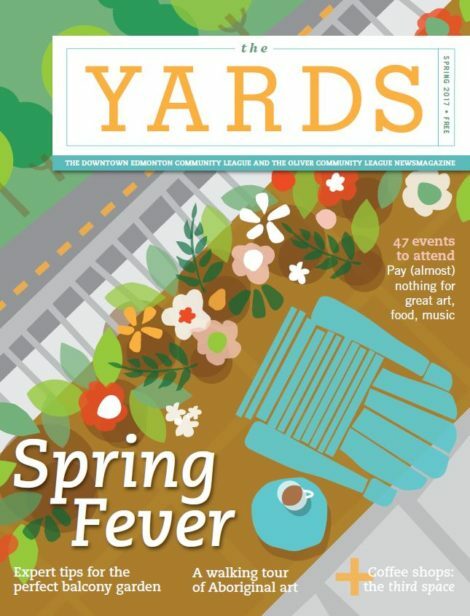 Are you looking to engage in urban food production or grow something more ornamental? Consider the general climate. Edmonton resides in the 4a zone on the Plant Hardiness Index. Choose plants labelled 4 or lower, which are suitable for cooler climes. Plants higher than 4 enjoy our warmest months but are more susceptible to seasonal change. Consider your micro-climate. Every balcony or garden plot will be different. These environmental factors dictate the types of plants that thrive best. • Be mindful of the direction your balcony faces, as well as any surrounding structures that may block sunlight. • East-facing balconies receive morning and afternoon sun, but usually retain a bit of the previous evening’s coolness. • West-facing balconies get afternoon and evening sun and are generally warmer than those that face east. • South-facing balconies enjoy the most direct sunlight and get maximum sun exposure during the hottest time of the day. Plants may require extra attention (watering more than once a day or some shade) to avoid drying out. • North-facing balconies receive little sunlight and are best suited for plants that thrive in the shade. Investigate the specific requirements for each plant. Read the plant tags, research online and ask questions at your gardening centre. • Shade-friendly plants include begonias, lobelias, pansies, ferns, hostas, ivy, and some leafy greens like lettuce, spinach and Swiss chard. • Sunnier areas are good for plants like marigolds, petunias, junipers, potato vines, tomatoes, strawberries, container eggplants, mini carrots, and herbs such as dill, thyme and oregano. Mind your height. Balconies located on higher floors are more prone to cooler temperatures, especially as summer begins to wind down. Wind is also a factor at as you get higher. Protect your plants from wind by using a windscreen or by shielding more delicate plants with other pots. Consider purchasing seedlings over seeds to get a head start. Many seeds require a longer growing season in our climate and will need to be grown indoors until the risk of frost passes. Use large containers to avoid clutter and to ensure that you don’t overcrowd your plants. Take into consideration how much room each plant needs to grow. Double-up your clay pots or use glazed pots to insulate and help prevent evaporation, and water at least once daily; limited soil space means that your soil will dry out quicker than the ground. Most importantly, have fun, and experiment with various plants if you can. “Enjoy it! You don’t want it to become a chore,” advises Keats. Need help getting your balcony garden started? 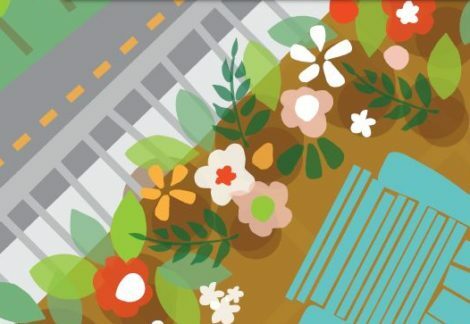 The Oliver Community League will host a balcony gardening workshop April 22 and 29 fro 1-3 pm at the Oliver Community Hall, 10326-118 St.. It’s an interactive workshop facilitated by OCL Garden Director, Justin Keats. You’ll learn gardening basics, including how to plan your space. Prepare to get inspired! A small $5 fee goes towards the OCL garden Capital Fund and donations are always appreciated. Oliver Community League has one community garden located at 10259-120 Street. The name Peace Garden Park was chosen because 103 Avenue was formerly known as Peace Avenue. No chemical fertilizers, pesticides and herbicides are used in the garden. To find out more about the garden and how to join, email garden@olivercommunity.com. Two options exist Downtown for those interested in community gardening. Our Urban Eden Garden located off Bellamy Hill has beds available to Downtown residents. The space is owned by the City of Edmonton, as part of its Partnership in Parks program. The second space opens this summer at Alex Decoteau Park on 105 Street. Plans include planters and composting facilities. 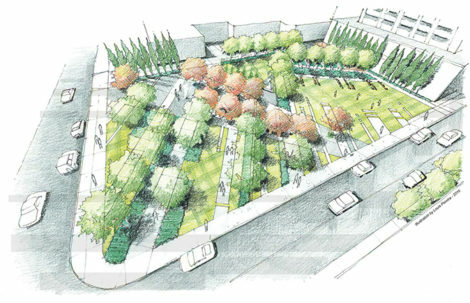 To find out more about the Alex Decoteau Park garden and to get involved email info@decl.org.